In "An Astronaut's Guide to Life on Earth," Chris Hadfield shares what he learned from flying in space. You still have a few hours to send us your questions for Chris Hadfield, Canada's superstar astronaut! SPACE.com's Managing Editor Tariq Malik and I will be interviewing Hadfield when he visits our office this afternoon. We'll be streaming our chat with him live over a webcast here starting at 4:30 EDT. We won't be able to take reader questions in real time, but if you submit one in the comments below or in a tweet (@SPACEdotcom / @meganigannon), we can ask on your behalf. Anything you're dying to know about his three spaceflights, his viral videos or his new book? Hadfield recently retired after a 21-year career with the Canadian Space Agency, capped by a 5-month flight aboard the International Space Station. During that voyage, Hadfield became the first Canadian commander of the orbiting lab and became internationally famous for his amazing videos about living in space. The social media-savvy space traveler is also a new author. 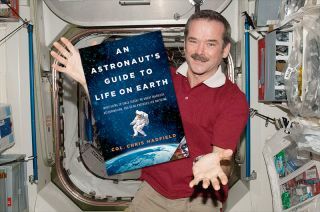 His book, "An Astronaut's Guide to Life on Earth" (Little, Brown and Company 2013), hit shelves this week. Follow Megan Gannon on Twitter and Google+. Follow us @SPACEdotcom, Facebook or Google+.